Gaetano Veneziano (1665-1716) was born in Bisceglie, a town on the Adriatic Sea, southern Italy. He studied with Francesco Provenzale (1624–1704) before becoming organist at the Naples court chapel, then its maestro di cappella. He went on to become the first maestro di cappella of the Conservatorio di Santa Maria di Loreto, Naples. His compositions include oratorios and passions and over 100 other sacred works from masses to motets. 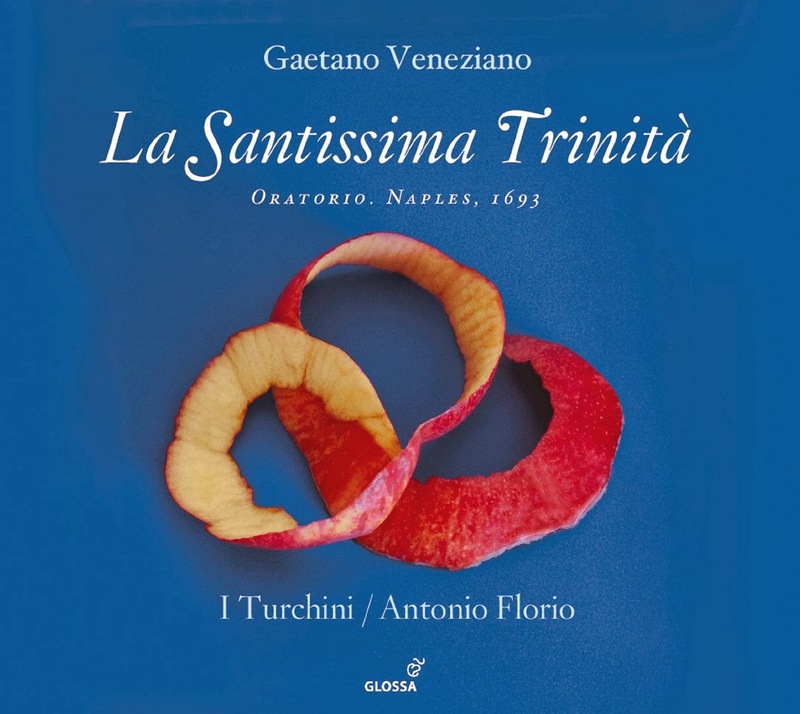 A new release from Glossa Music www.glossamusic.com brings us Veneziano’s oratorio La Santissima Trinità written in Naples in 1693. It was found with three other oratorios by Veneziano in the library of the Conservatoire Royal of Brussels bearing the title Oratorij diversi posti in musica da Gaetano Venetiano organista della Real Cappella di Napoli. The librettist was the dramatist Andrea Perrucci (1651-1704) who wrote a large number of libretti for secular opera and sacred dramas and works with Veneziano’s teacher Provenzale. In one single act, La Santissima Trinità concerns three allegorical characters who represent the Holy Trinity, God the Father (Onnipotenza), the Son (Amor Divino) and the Holy spirit (Sapienza) and jointly defend the rights of the Immaculate Virgin against Satan (Peccato). On this recording the soloists are Leslie Visco (soprano) as Vergine (Virgin), Cristina Grifone (soprano) as Amore Divino (Divine Love), Filippo Mineccia (countertenor) as Sapienza (Wisdom), Rosario Totaro (tenor) as Onnipotenza (Omnipotence) and Giuseppe Naviglio (bass) as Peccato (Sin) with I Turchini www.iturchini.it , a small period ensemble consisting of eight instrumentalists, directed by Antonio Florio www.iturchini.it/antonio-florio . The rather doleful opening, Sinfonia Avanti l’Oratorio, is soon transformed into a lively melody before all five soloists join in the Divini atrributi (Attributes of the Divine). All have distinctive voices yet blend very well together with a somewhat theatrical flavour. Tenor Rosario Totaro enters as Onnipotenza for the recitative Io, che fabra di luce (I who produce the light) and aria Impiegata a l’Onnipotenza per formala (That Omnipotence was involved in her creation), a real character tenor. Countertenor Filippo Mineccia as Sapienza has a particularly fine voice, beautifully controlled, with some lovely timbres in the recitative Io che dal seno eterno (I who from the eternal womb) (Sapienza) and aria Quanto so, voglio crearla (All I know is that I shall create her). A very sweet sounding Cristina Grifone (soprano) as Amore Divino sings the recitative Et io che da due seni spirato (And I who emerged from two breasts) with lovely little decorations and not lacking in strength, before the aria Sono amore et innamorato (I am love and in love) where she is so well chosen for this role. Cristina Grifone, Filippo Mineccia and Rosario Totaro come together for Venga a’luce chi la luce (Let he be born whose spendour) blending well dramatically. Soprano, Leslie Visco as Vergine sings the lovely aria Il più bello, il più nobile oggetto (The most beautiful, most noble object) with a pure voice bringing much to this aria, one of the most attractive in the oratorio with lovely playing from I Turchini with some fine textures. She is equally impressive in the recitative Ordinata ab aeterno (Formed from eternity), the aria Quel guardo che amoroso (That look that lovingly) and the recitative Quel fonte che di grazia I fiumi spande (The source that makes the rivers flow with grace) where she brings her pure voice, with the light textures, to the intimate instrumental sound of the ensemble. She makes this recitative sound so lovely. Rosario Totaro provides the perfect contrast in the aria Quanto sei bella, figlia mia cara, full of character as he sings How beautiful you are, dear daughter before the brief recitative Sei la maggior dell’opre mie più eccelse (You are the greatest of my noblest works) that leads to the aria Se bella io sono (If I am beautiful) where soprano, Leslie Visco returns with a brilliant performance, quite a highlight of this disc, before the slow recitative Se con la luce tua m’illumini e onori (If your light illuminates and honours me). Filippo Mineccia returns for the lovely aria Ti compose di gigli e di rose (You were made of lilies and roses) and, after the brief recitative, Dell’eterno saper, opra ti miro (The work of eternal wisdom, I regard you) there is a lively and direct aria Vieni e cogli, mio caro, i germogli (Come and gather, my beloved, the buds) from Leslie Visco, beautifully sung. Cristina Grifone returns for the lovely aria Mia colomba intemerata (My spotless dove) sung with a direct simplicity that is most attractive and with a lovely dialogue with the ensemble. After the brief recitative Se il Vostro amore del tuo cor s’infiamma (If your love inflames your heart), there is a fine instrumental introduction to Il tuo stral divino arciero (Your arrow, divine archer, wounded while creating me), an extended aria with varying moods where Leslie Visco brings more pathos and depth to her part. The instrumentalists lend a lovely depth throughout. Cristina Grifone, Filippo Mineccia and Rosario Totaro are very theatrical in Per dar al tron d’Iddio nuov’ornamento (New adornment to the throne of God), with these singers making a fine trio. With the recitative Lungi il Peccato? (May Sin be far away?) bass, Giuseppe Naviglio, appears as Peccato (The Devil) for the first time. He gives a terrific performance so dramatically characterised with his rich, powerful, flexible voice which he also brings to the aria Su schiere, mie fiere (Line up my braves) a rhythmic piece which is great fun and most brilliantly done with the ensemble playing so well. Leslie Visco briefly joins Giuseppe Naviglio for Vomiterò da quest’ingorda bocca (I shall spew my gluttonous mouth), an accompanied recitative before she sings the surprisingly lively and jolly aria Come orrendo, superbo e tremendo (Horrible haughty and terrifying the monster from Hell is). Cristina Grifone, Filippo Mineccia and Rosario Totaro again come to together for Tecco è lo sposo eterno (Your eternal bridegroom is with you), a fast moving trio, so well written, with overlapping and combining the voices finely done. There is more terrific writing in the recitative Dunque una creatura (So can a creature) and aria Se poi non s’osserva la legge (If the law is not respected) with Giuseppe Naviglio bringing more terrific singing. The brief but effective recitative Si’che in potere è di chi tutto regge (One who rules over all has the power) is shared in turn by Onnipotenza, Sapienza and Amore Divino before another lively aria for Leslie Visco, Mostro orribile invan ti scuoti (Vile monster, you writhe around in vain), where the composer seems to take the text rather lightly. The short recitative Tanto vuol Dio, che il suo poter mi diè has Vergine and Peccato in conflict, with Visco singing God who gave me his power, so wills it and Naviglio, as Peccato, responding with Pride, ambition, blind ignorance. Naviglio characterises the rhythmically lithe aria Tutti assistetemi mostri del tartaro (Assist me all you monsters of Hell) so well, with great flexibility. It is Rosario Totaro that opens the recitative Aquila invitta mia (My unconquerable eagle) before soon being joined by Filippo Mineccia, Giuseppe Naviglio and Leslie Visco in a really dramatic section, especially when Naviglio joins in. After Onnipotenza’s aria Chi a’languidi seni rimedio darà (Can one who will cure the sick at heart), Rosario Totaro sings the recitative, No, che non può temer di Tosco immondo (No, the Virgin who will cure the world) where he is joined at the end by Filippo Mineccia. There is some fine playing from the ensemble in the opening of the lovely little aria, Spezzerai tu le catene (You will break the chains) finely sung by Filippo Mineccia, beautifully controlled and flexible. After the brief recitative Se Amore a ciò ti spinge (Since Love inspires you), Cristina Grifone gives us the recitative Senz’ombra concetta (Conceived without sin). Leslie Visco brings the recitative Accetto il peso e a liberar m’accingo l’anime de’miei fidi (I accept the burden and am ready to free the souls of my devotees)) before the lovely aria Figli miei, venite a me (My children come to me), gently at first before becoming lively at the words I promise to save you from the proud serpent I trampled underfoot. Bass, tenor, countertenor and soprano Cristina Grifone come together for the short but dramatic recitative Quante soverchierie contro un perdente (So much abuse heaped upon a loser?) before bass, Giuseppe Naviglio, as Peccato, sings the aria Invan chiedo vendetta (I have power no longer) but bass, Guiseppe Naviglio has power galore as he weaves beautifully around the instrumentalists. After Vergine, Spaienza, Amore Divino and Onnipotenza sing Vittoria per Maria (Mary is victorious, the dragon is dead), the final tutti from all the soloists makes a terrific conclusion, these singers working so well together. This is a very attractive oratorio, well worth getting to know, with some particularly fine arias and dramatic moments. I Turchini directed by Antonio Florio are first rate and, overall, the cast is very strong featuring some particularly fine individual singers. The recording from the Chiesa dei Servi di Maria, Sorrento, Italy is excellent and there are informative booklet notes, full texts and English translation. Splendida iniziativa, di altissimo livello!